Issue by compensating probes. Signal goes down after few minutes. 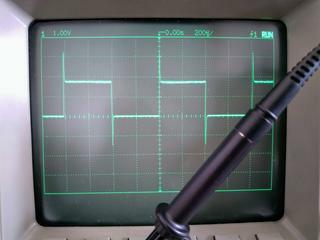 I think the first thing to sort out is – Is it the probe or the scope input doing this? Do you have more than one probe and do they all do it? Do both channels do it? One explanation of what is happening is the channel is becoming AC coupled (DC resistance is going up). 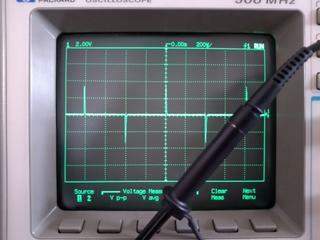 You could put an ohm meter on the scope input and watch what the resistance does over time. You could bypass the probes and connect the probe comp output (or other source if you have one) directly to the channel and check out what happens over time. 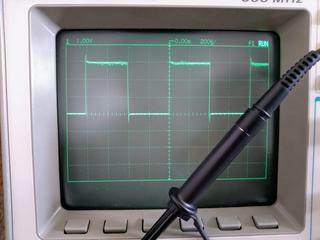 There are two input impedance modes to the scope. 50ohm and 1meg. Do they both act up over time? Note, you can’t use the probe comp signal with 50ohm input mode. I will do all the tests you told me and I will be back with answers! - It happens when I go up to 200mV/div. - If I change the scale to the next upper step, 500mV / div and over ... I've got the signal that you can see in the 3rd picture. The resistance in both channels keeps stable, around 48/52 ohms and around 1Meg depending the configuration. The 200mV/div and 500mV/div point is where an attenuator changes from div by 1 to div by 25. You should hear a click between these two points. The data you collected suggests something is wrong with the /25 attenuator. Could be a switch contact problem. Unfortunately, that attenuator is on a thick film hybrid and repair would not be for the faint of heart. Yes, I can hear a "click" between the 200mV/Div and 500mV/Div. At this point I do not know how can I do so this is my first time I try to fix gear like this. This is the relay that I hear when I go from 200mV/div to 500mV/div. "This is the relay that I hear when I go from 200mV/div to 500mV/"
No. The 200mV/500mV click is coming from inside the big metal object you see in the right side of the picture. It has been a long time since I have seen a schematic, but if I had to guess, that relay is selecting the trigger channel. The guts of thatrelay are well inside. It is hard to imagine that that small notch on the side would impact the operation. Although, makes me wonder how it got there. I've get some schematics from this forum but it looks they are for 5400 series. May be handy. I will try to dismantle this part and then take a look inside. Just in case. To be honest I do not know. This is the second time I dismantle the oscilloscope and I noticed just in the second time. 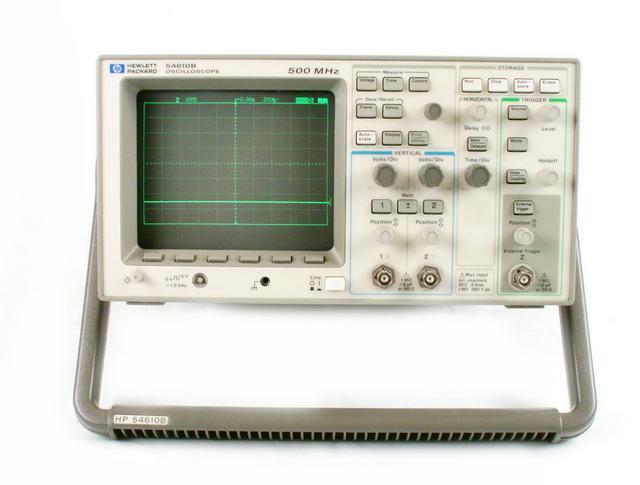 I got the oscilloscope from a friend that is working at the university so I do not know how much could go wrong. I will continue my investigations! PS: I hope to fix this. If not I probably put the oscilloscope in to the recycle bin. Looks like I found the problem. I tried to dismantle the main board. 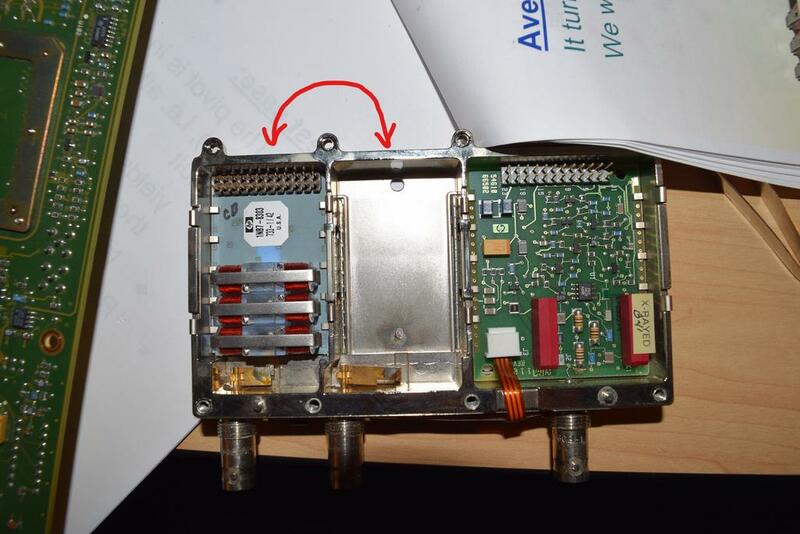 Inside "that metallic box" I can see three modules: Channel 1, 2 and External trigger. The modules for the channel 1 and channel 2 are the same. Looks like a big relay or something like that. I swapped the modules in between themselves (Channel 1 on Channel 2 and Channel 2 on Channel 1) and... Now the calibration fails on Channel 2 and I got the same problem on Channel 2 when I try to go from 200mV/Div to 500mV/Div. 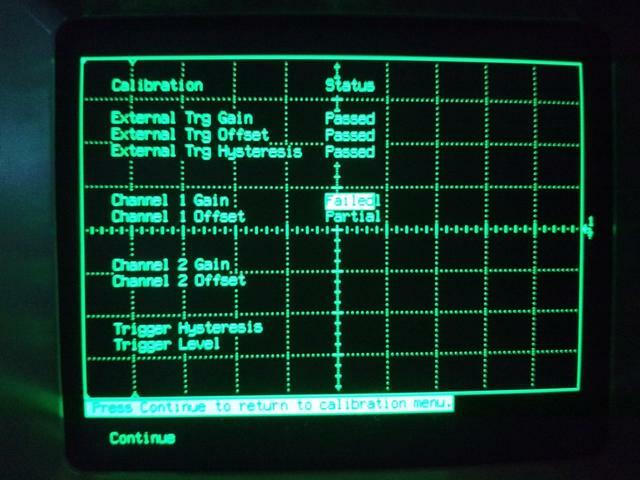 But now looks like there is not losing of signal if I left the probe for a while connected to the calibration point. 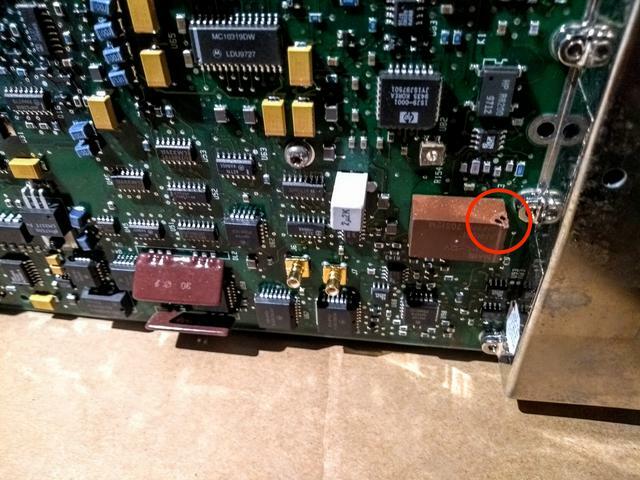 So I guess the problem is in that module. Looks like is that big relay (or whatever it is). Now the next step is look for a replacement. That device is more than a relay. It contain the attenuator, attenuator switches, 50ohm termination, 500MHz preamplifier with adjustable gain and trigger comparator. It was used in a number of scopes. They had different metal cases around them. But the hybrid inside was the same. Seems to me I saw them on Ebay years ago. Thank you very much for your help. I never would never have found the mistake without your help. I took the picture from above as an example. Mine is exactly the same but it has 2 PCBs. One for each channel. So I guess that I need that 1NB7-8303 730-1/42 part. 1NB7-8303 is the hybrid part number. 730 1/42 is the date code. it has the 1NB7-8303 part inside the case, you can remove it and put it in your case. Yes, you are correct. I found some replacements on eBay. I tried do a search about the relays but I see this part is a custom made part for HP.